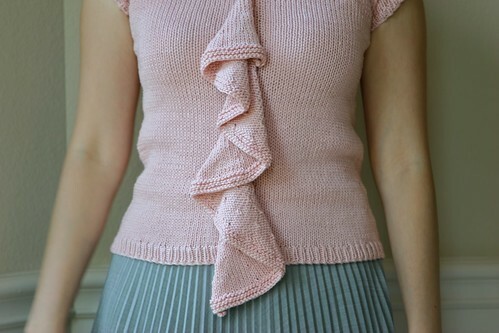 Notes: This is a cute, straightforward pattern. The only minor point of confusion for me was doing the slipped stitch on the front, which occurs between 2 purl stitches. It wasn’t entirely clear to me at first whether to slip the stitch with the yarn in front or yarn in back. The answer is: yarn in back (thank you gwenuvere). The narrowest part of the waist shaping hits higher than in most other patterns, and I wasn’t sure how that would work out, but I think it looks fine. Rather than finishing off the neck edge by picking up stitches and then immediately binding off (which would have actually been a lot faster for me), I forced myself to do a crochet edge to practice a bit more crochet. 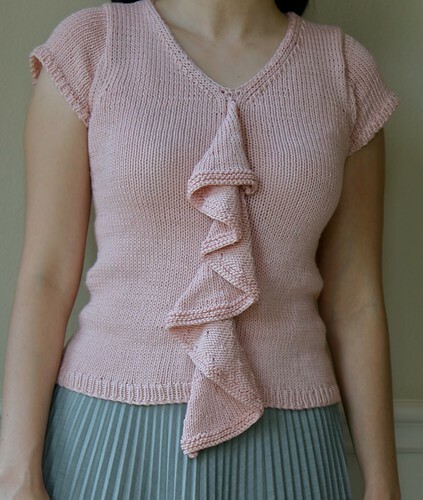 I got the Nashua Handknits June on clearance and really like it. Every now and then, I’d detect just the slightest plasticky crunch when working with it, but for the most part, I really didn’t notice that it’s a synthetic. It’s very soft and pretty flowy. I suspect the ruffle would have been a little better drape if I had used the yarn the pattern calls for, but it still works.